Well, I’ve finally done it. More than twelve years after moving to Canberra, I have finally been to one of Rep’s winter variety shows. I recall that it was originally recommended to me in 1998 as an undergraduate beginning a Theatre Studies major at the ANU, as an excellent example of the music hall tradition, so there’s something bittersweet in having finally attended in the same week that the ANU’s Theatre Studies major met its demise. The cast certainly delivers. After a slightly flat first half, which could be put down to opening night, the second was quite magical. Ian Croker’s rendition of Minnie the Moocher got the audience engaged, and Christine Forbes followed this with a beautifully theatrical The Girl from 14G, about which she bragged that she was overjoyed to be able to wear her pyjamas on stage! I felt my personal cringe factor rise when we were informed that the finale was to be a rendition of Peter Allen‘s perfectly horrid canticle I Still Call Australia Home, but it dissipated completely with the cast’s magnificent send-up of the song’s overwrought history. A variety show stands or falls on the energy of its cast, and this cast certainly works hard for their applause. 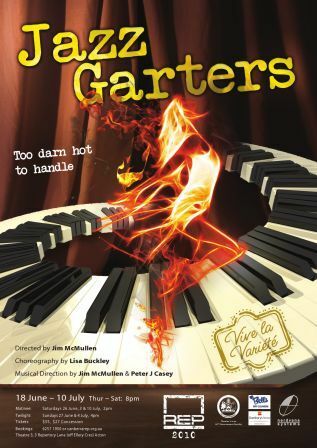 After a flat start, the energy flowed and made Jazz Garters a fun and entertaining show, well worth a night out.